What will happen to your family and your lifestyle if you get injured and can't work? What will you lose if you get injured? � Exerting force to perform a task or to use a tool. � Working in positions such as bending, stooping, twisting, and overhead reaching. � Remaining in the same position for a long time with little or no movement. 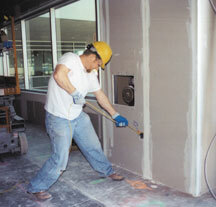 � Continuous pressure from a hard surface or edge on any part of the body. 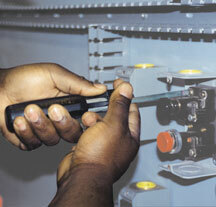 � Working in very hot or cold temperatures, produced by climate, equipment, or machines. � Sitting on, standing on, or holding equipment or tools that vibrates. In addition, stressful conditions can increase muscle tension and reduce awareness of proper work technique. � Stretch S-L-O-W-L-Y and hold each stretch 3 - 5 seconds. � Stretch a few minutes before and during your workday. Caution: Check with your doctor before exercising. If you feel discomfort while exercising stop immediately! While you are off work, keep yourself physically ready for returning to work whether it's the next day or later. If you experience symptoms, you must change the way you work or the tools you use. If you don't change, your symptoms may get worse and keep you from working at all. � Talk with your supervisor about your symptoms right away. � Work with your foreman or supervisor to identify the cause of the problem. � Follow your company's ergonomics program and its Injury and Illness Prevention Program. � Always look for better ways to do your job. Repetitious hand work may cause pain and result in permanent injury, limiting your ability to use your hands in any kind of work. 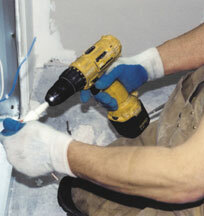 � Use hand tools or power tools whenever possible. 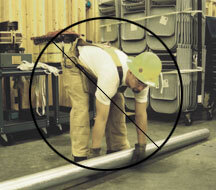 � Keep tools close to your body to reduce fatigue and increase productivity. 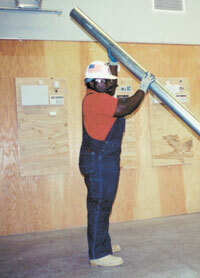 � Use a three-point lift when handling heavy material by youself. 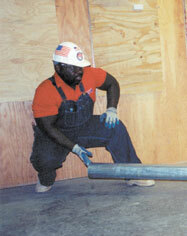 � Stack or rack conduit at waist height to reduce bending and stooping. � Use teamwork and mechanical aids whenever possible. 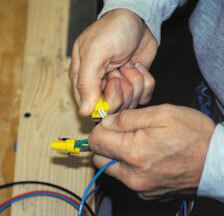 The force and awkward posture required to pull wire by hands is hard and tiring. 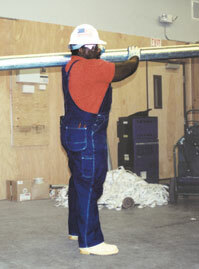 � Communication between the puller and feeder to coordinate movements will make the job easier and safer. LIGHTEN YOUR LOAD. Plan what you are going to do. Carry only the tools or equipment you will need. 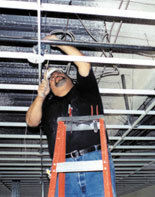 Wear a tool belt that fits and distribute the tools and materials evenly. PROTECT YOURSELF. Wear safety gear that fits. Protect your knees from hard, sharp surfaces by wearing knee pads. Wear appropriate eye protection to protect your eyes from debris and flying particles. 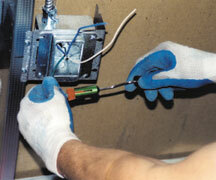 Protect your hands from friction and sharp edges by wearing gloves. SELECT THE RIGHT TOOL. Choose tools that fit your hand comfortably and have soft grips. 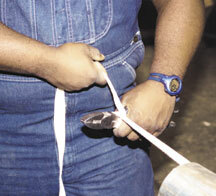 A good handle grip prevents your hand from slipping while using the tool. Consider using tools that reduce the amount of force or movements you use. Keep tools well maintained. PRACTICE GOOD HOUSEKEEPING. 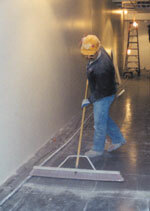 Pick up debris and scrap material to prevent trips, slips, and falls. Good housekeeping allows you and your equipment to get closer to your work. CHANGE BODY POSITIONS. Working overhead, at floor level, or in cramped spaces forces the body into awkward postures. To relieve muscle tension and improve circulation, change body positions, alternate tasks, and stretch throughout the day. Carrying a 10 lb. object that is 25" from your spine is equal to 250 lbs. of force on your lower back. LIFT SMART: Keep loads and tools close to your body. The farther the load or tool is from your spine, the greater the force on your lower back. Carrying a 10 lb. object that is 10" from your spine is equal to 100 lbs. of force on your lower back. � Start work early in the day. Avoid extreme heat. � Wear light-colored and loose-fitting clothing. � Take frequent breaks in the shade. � Drink water frequently before, during, and even after work. Drink water even if you are not thirsty. Heat illness can cause fatigue, dizziness and painful muscle cramps. REMEMBER: HEAT ILLNESS CAN KILL IN LESS THAN ONE HOUR OF EXPOSURE TO EXTREME HEAT! SAN FERNANDO VALLEY - SANTA BARBARA & NORTHWEST L.A. CO.
SANTA FE SPRINGS - L.A. METRO AREA & ORANGE CO.